Once upon a time, DVD players were split into two camps—high-end DVD players costing $2,000 or more, and the great-unwashed DVD player masses huddling under $200, a 10:1 price ratio difference. Then along came China, and everything changed. China flooded the U.S. market with its $20-$30 DVD players, with some, incredibly, even featuring progressive output. By the high-end’s 10:1 pricing logic, any new made in China high-end DVD player should cost about $200 or so. And indeed this is exactly what happened. Say hello to Oppo, a made in China operation offering DVD players that must have traditional high-end vendors crapping their pants, not too mention regular consumer electronics makers. Case in point, Oppo’s astonishing $200 OPDV-971H player (DV-971). Oppo is the new U.S. marketing creation of BBK Electronics of China, which was founded in the mid-1990s and is a major player in China. It’s a big player in more ways than one, apparently, because in 2001 the company sponsored the “BBK Tiger Woods Mission Hills Challenge” at Mission Hills Golf Club, which is one of Asia's leading golf and country clubs, located in Shenzhen of south China's Guangdong province. Tiger gets around. In addition to the DV-971’s component video, S-video, and composite video outputs, there are S/PDIF coax and optical digital audio connections. A HDMI compatible DVI output is featured for digital video, and the DV-971 comes with a no extra cost DVI cable, as well as a DVI to HDMI cable connector. DVD Video, DVD Audio, DivXÂ®, XviD, Audio CD, HDCD, WMA, DVD+R/RW, DVD-R/RW, CD-R/RW, Kodak Picture, and mp3. But the icing on the Oppo DV-971 cake is its Genesis FLI2310 chip that handles format conversions (like deinterlacing), upscaling and aspect ratio control and which incorporates Faroudja's award-winning DCDi video processing technology. The Genesis/Faroudja feature only works via the player’s DVI connection and can upconvert 480i DVD sources to 480p, 720p and 1080i for display on your HDTV. If that wasn’t enough for 200 bucks, Oppo has upped the ante again with its new $150 DV-970HD player (DV-970), which in addition to supporting all of the above DV-971 formats, also adds SACD support, as well as improved DivX and Xvid IDX+SUB subtitle support. But unlike the DV-971, the Oppo DV-970 also features a port for connecting USB 1.1 devices, like thumb drives and mp3 players (FAT format, only), as well as sports a 4-in-1 card reader, all of which are located on the front panel. Still don’t have your attention? The DV-970 also offers combined digital sound and digital video output via its HDMI (v.1.1) interface, instead of video-only DVI, as on the DV-971. (Note: unlike HDMI that can output 480i and up, DVI is limited to 480P and up). Digital audio-only can be handled via its coax and optical connectors. BTW, the HDMI audio output can be toggled on or off from the setup menu, so if no sound comes out, check the HDMI setting. As always, use of all HDMI features require that all the components in the signal processing chain, including the receiver or processor, have the same HDMI rev, in this case, v.1.1. For example, if the receiver or processor only supports HDMI 1.0, DVD-Audio and SACD will not be sent via HDMI and you must use the multi--channel analog outputs. Regardless, whether you have HDMI 1.1 support throughout the component chain or not, with SACD you have to use the multi--channel analog outputs. A way around this, and perhaps uniquely to the DV-970, the SACD (DSD) bitstream format can be converted to high resolution PCM (88.1 kHz/24 bit) and sent, like DVD-Audio PCM, over HDMI. 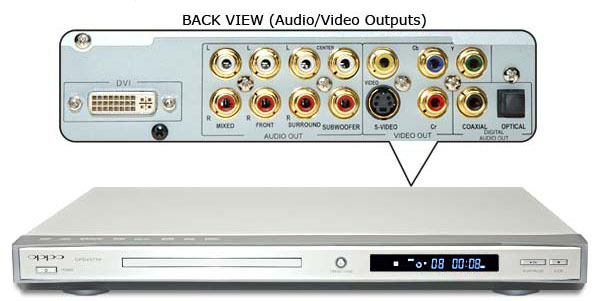 Further unlike the DV-971, the DV-970 also features progressive video output (480p, only) via its component connections. A look at the respective players’ video processing guts perhaps shows why. Both the DV-971 and the DV-970 use a Mediatek (MTK) MPEG decoder. But, the DV-970 exclusively uses the MTK chip for all video processing—the DV-970 does not have the Genesis FLI2310 chip with Faroudja video processing. On the other hand, 480p support over component video and HDMI's 420p, 720p and 1080i capabilities make the DV-970 a great choice as a universal digital transport feeding an outboard video processor. Both the DV-971 and DV-970 are home upgradeable via firmware updates on the Oppo web site. Just burn a CD, load the player, and away you go. Both Oppo players use the same type remote control unit. The remote is fairly easy to use, but doesn’t set new standards in usability. Both players load really fast, zip through chapters, and they are very quiet as they go about their whirring business. Now on to the show. How do the two units compare in video capabilities? The clear winner is the DV-971. This was evidenced time and time again in its ability to pull out picture detail that the DV-970 couldn’t. One good example was found in the must-rent DVD, “Brick”, a film noir detective story set, if you can believe it, in high school. In the climactic scene between the aspiring acne’d Bogart and the only recently post-pubescent femme fatale, she is wearing a 1930’s style hat with a big feather flower on it. On the HD-97I her artificial flower bloomed in multi-feathered glory. On the HD-970, it was still waiting to bud. Another clear example was seen in Master and Commander, in the on deck sequence just before the French ship struck out of the fog and turned the English vessel into The Ship of Flying Toothpicks. The officer’s uniforms were meticulously detailed for historical accuracy, right down to the coat buttons. The HD-971 showed all the movie’s costumer pain staking work in exact detail. But the HD-970 left some buttons undone, as it were. And so it went, film after film. On the other hand, if you didn’t have a chance to compare these two DVD players side by side, as I did, you would probably never know what you were missing with the HD-970. Its picture is first-class, regardless. As for deinterlacing, the HD-970 was quite good, but not up to the superb job that the HD-971 and Faroudja’s DCDi performed. I also saw no macroblocking artifacts, which can make a DVD picture a pretty mess, with either Oppo unit. As for audio, both the HD-971 and the HD-970 support DTS and Dolby Digital surround sound, and they do equally great, bang up jobs of delivering intelligible dialog and the big boom-boom. Surround audio music was also a hugely satisfying experience with either of these players; with the added benefit that SACD support is also featured in the HD-970. Something else beyond SACD support was also at work with the HD-970. Overall, this player did a superior job reproducing audio. It's ability to create an all-enveloping, you-are-there sound field was better than the HD-971's. Overall timbre and tonal balance was also better than the HD-971. So it's an interesting tradeoff between these two players; which is more important to you, superior picture or superior sound? If you have a good surround sound rig, like the awesome M&K S-150P speakers that I used during this review, then like me,you may opt for the sonic spectaculars. On another note, I have seen some reports, including supposedly some by Oppo, that say the only way to get full output of both DVD Audio and SACD on the DV-970 is to set the output to 1080i, otherwise musical bits and some channels go AWOL. I didn’t experience this problem, so be sure to check as your surround mileage may vary. In any event, either player used as an audio source will feel right at home in almost any rig, including megabuck high-end setups. In sum, the Oppo HD-971 and HD-970 set new benchmarks for terrific, high-end video and audio at prices that just a few years ago would been laughed at as impossible. Well, the impossible is now here, and it makes you wonder what else is coming our way from China. If I were Sony or Panasonic, or even a South Korean behemoth like Samsung, I wouldn’t be getting too much sleep at night worrying about what’s coming next from this awakened Asian giant. You won’t be getting much sleep either with these two outstanding DVD players, but for all the right reasons.